Vincent is charming. With a little bit of square, and a little bit of round, do not mistake him for a complete gentleman, though. He's got a little bit of goof underneath that collar. Vincent features a row of alternating pyramid and round spots that adorn the length of the top of the collar. This is a double leather collar that is being offered in a wide variety of widths with taper or no taper at the buckle. Your choice in the menu below. Vincent is available in brass or silver hardware. 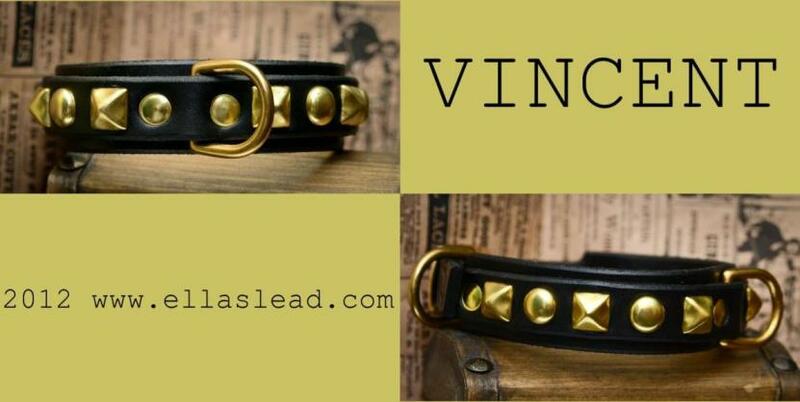 Vincent is the perfect medium-large dog collar. You will also have the option to "Single" your Vincent which is the option to have a single leather collar instead of a double leather collar. The product photo is a double leather collar that is 1 1/8" wide, tapered to 3/4" at the buckle.